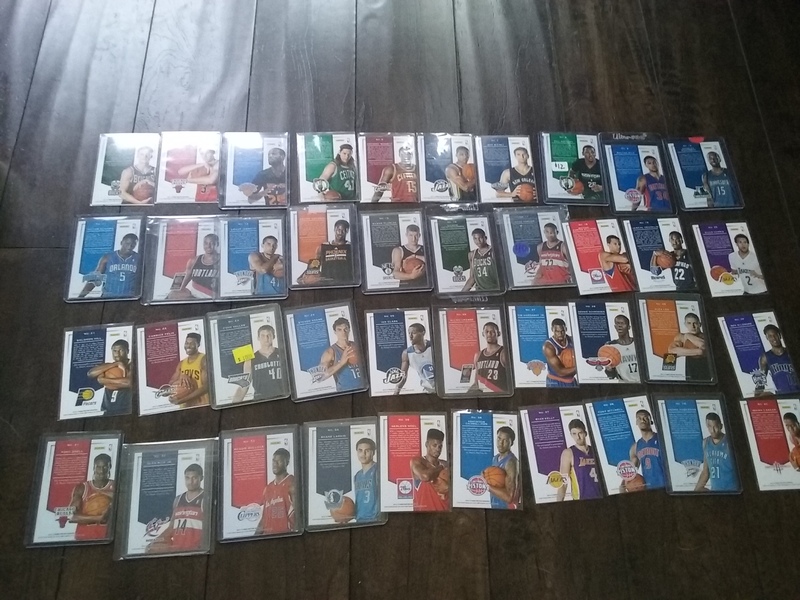 I probably finished this set off six weeks ago when I grabbed the CJ MCollum card on Ebay but because the COMC cards were not in my possession, I didn’t get custody of all of the cards until Thursday. 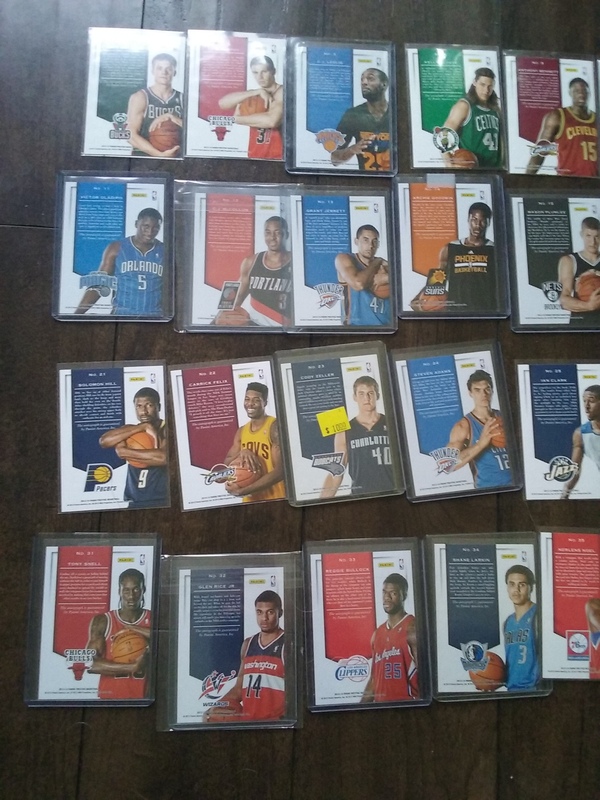 Hardest cards to find: Victor Oladipo & Ben McLemore. Ponied up $11 for the McLemore without blinking because I didn’t see it for sale anywhere (Beckett, Ebay, SportLots, COMC). I grabbed that card probably an hour after it was posted on COMC and I would’ve paid more but am thankful that I didn’t. Cody Zeller gets an honorable mention here. Card that I didn’t appreciate when I pulled it: Giannis. Granted it was with a case I bought myself for graduating college but I would have never bought it and thus never completed the set if I didn’t pull it. Most I paid for a single card: $32 for C.J. McCollum. I hope that his career trajectory continues and validates the price. I probably spent more money than I should have on a horrendous rookies class but I don’t regret it. 90% of it was funded from Swagbucks anyway. I don’t regret it because completing the set feels amazing, especially because I pictures myself doing something like this again. This was the only autograph set from the set that I had a realistic chance of completing so I focused on it. I might have 2 more tricks up my sleeve for my Prestige set so hopefully I have more to come; at least one definite. I just checked my calendar and am thankful enough to have a busy week so I am posting this tonight. As readers know, I have a bad tendency to sit on maildays. In this case, sitting on a Christmas ‘gift’ worked out. I was hungry for a box of cards because I didn’t get any on Easter. Thankfully I had my 2016 Goodwin Champions box to help, or did I. Before I move on I want to thank GoGTSLive, the best sports card show on the planet that airs every Thursday for sending this me. This low budget collector got a box that I have always enjoyed because of them. Unfortunately I got skunked on the holiday two times over. Fortunately a bad box of Goodwin Champions is still a good box. I really only issue with the box as you will see. Going to start off with the bad first. The best card from the box wasn’t even a hit but this Justin Gatlin Lady Luck cloth mini. Beautiful card but the way that it was loaded in the pack caused it to be damaged. The right side is so beat up that it looks like it was shipped without a toploader in a plain white envelope. The card came out bent as a result of the placement in the pact, but after being sandwiched between all the decoy cards to try and smooth it out, it is better. Beautiful card. Actually if you look at the card for sale on COMC it looks worse off than mine: https://www.comc.com/Cards/MultiSport/2016/Upper_Deck_Goodwin_Champions_-_Base_-_Cloth_Minis_Lady_Luck_Back/71/Justin_Gatlin/11561047 I am going to be including a ton of COMC links to show comparable cards in this post, none of which are mine. Pictures don’t do the cloth justice. It had potential to be a real beautiful card. Let’s move on to the hits. Both nothing to boast about. A relic of a golfer that I have never heard of and a autograph Canadian Rugby player who I have definitely never heard of. Interestingly if you look at the ‘hits’ for sale from this set, I pulled probably 2 of the cheapest 10 for sale. I hate that I think that way now. The base set and inserts are really great. I would love to put together a base set of this, and insert set for that matter. 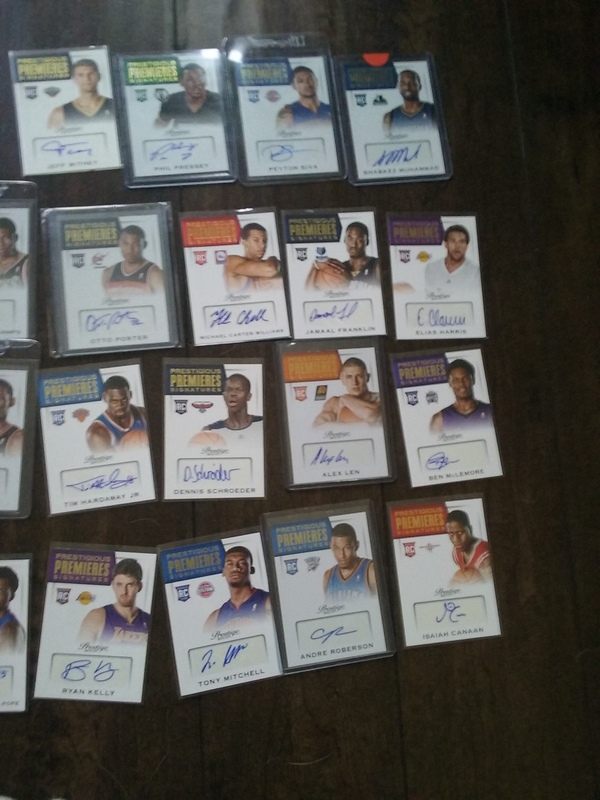 I picked up a handful of cards this week from Ebay that put a dent in my Prestige collection. 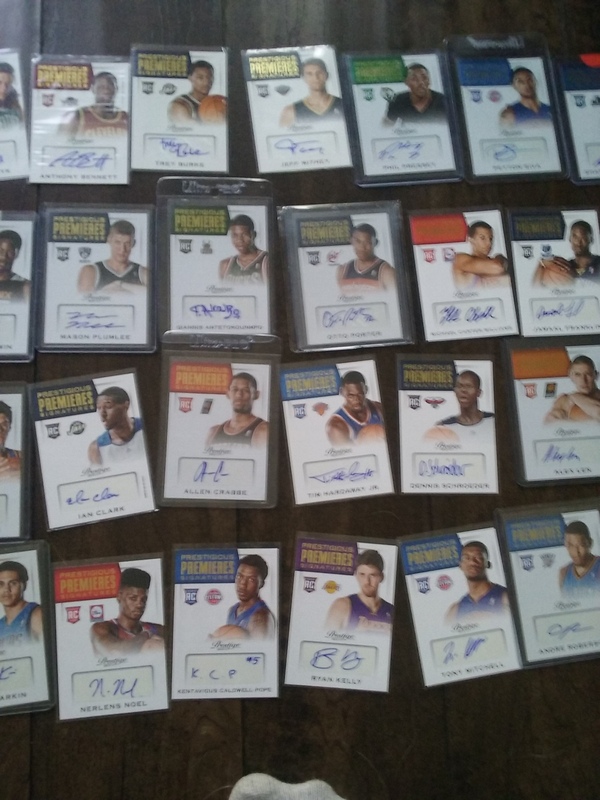 At this point it is pretty hard to find a seller that has a ton of cards I need. The first 4 pictures, 12 cards, 10 that I needed are from 1 seller. By some miracle, I paid about $20 for the lot. The reality is that if you told me I could get a quarter of these for that price, I would’ve taken it; albeit not been ecstatic. Here is a grievance though, $8 of that $20 was for shipping. The seller didn’t even pocket the majority of the money as he shipped it in a box with peanuts instead of a bubble mailer. On the plus side, I could say that I put a dent in my collection for dollar cards. They may look like it but they are not; and that is not just me saying that. I could’ve paid $12.99 for a similar David West card, which is what I essentially paid for the lot. Those pictures were boring I know. Here is some to jazz things up. I picked these cards, the Anthony boys, for cheap in hopes that I can flip them and recoup what I paid. I also picked up this. I needed the Chris Paul. I loved the Tyrus Thomas patch as it shows how great the Bobcats colors were. I figure that I can flip the Stuckey. Meant to post this a few days ago but I have been fortunate enough to be busy this week. Two job interview, a meeting at an employment office, as well as Deacons duties. I celebrated my busy week by opening two boxes of cards. 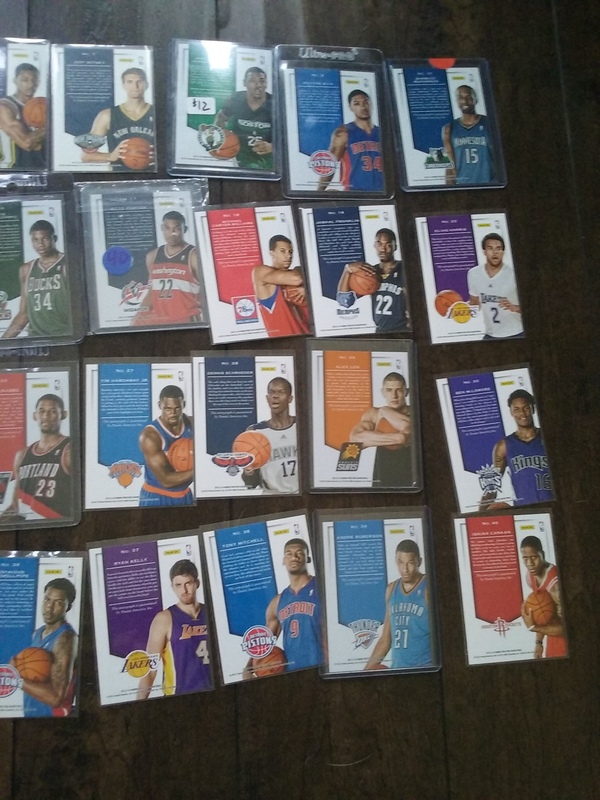 I opened my 2 Prestige 2013/14 boxes. I still have my GoGTS Christmas box sitting on my desk. The way that it worked out, is that what is seemingly the worst hit of the box is actually the best hit in my mind. I needed the Al Jefferson jersey card. Other hits were Tyson Chandler & Isaiah Canan autographs. While I have the Chandler auto, I am so versed in Prestige boxes that I know that there is only 2 or 3 Distinctive Ink per case. That card was the only numbered one as it is limited to 50. Otto Porter rookie jersey is the last hit. This box also yielded 2 silver Bonus Shots parallels. Not a bad box one bit considering the product. For what the product is, this box is probably above average. Despite beating the odds and getting 5 hits, this box was nothing special. It was as if Panini knew that fact and threw in an extra autograph to make up for it. Corey Brewer, Epke Udoh, and Jan Vessely autographs; non of which were numbered, another atrocity. Channing Frye and Otto Porter jerseys round out the box. 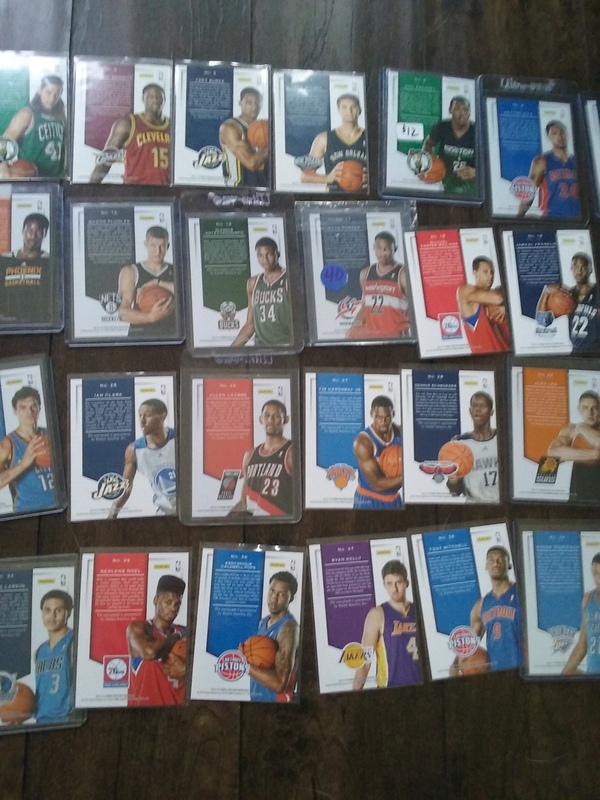 Yes, I pulled 2 Otto Porter jerseys. I still love this product. I am getting close to finishing off my True Colors jersey set from it. 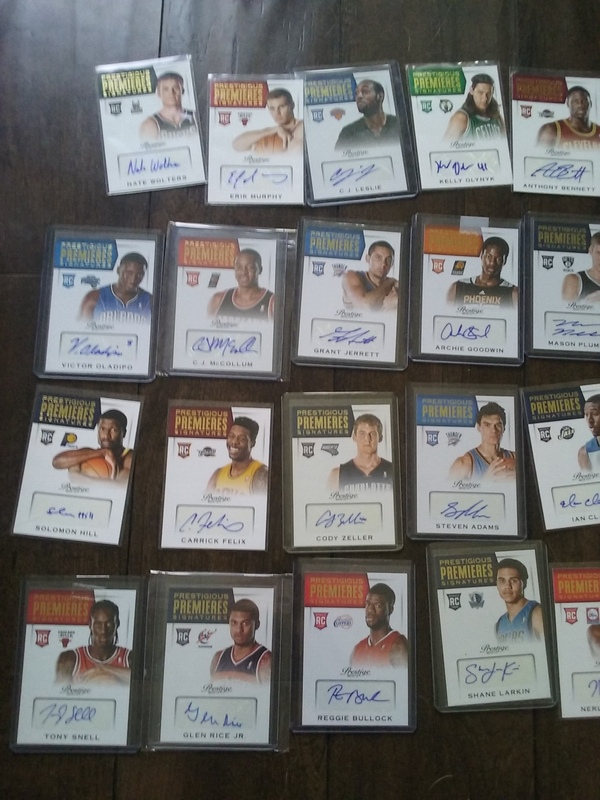 If I account for what it is in my COMC account, and not my custody I finished off the Prestigious Premieres auto set. I can’t wait to take a picture with all of those cards together. My sole focus and nothing else has been this set. Collect what you love. It will be priceless to you.